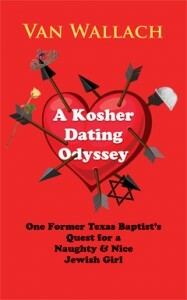 A Kosher Dating Odyssey: One Former Texas Baptist’s Quest for a Naughty & Nice Jewish Girl ($12.95, 204 pages, ISBN: 978-1-60381-132-3), a humorous memoir about the special challenges of dating when you’re an ex-Baptist Jewish intellectual single guy. “Through an online Odyssean-style search to find his Jewish match, Wallach somehow manages to carve deep self-esteem out of multiple rejection. How refreshing! How revealing! But thank God he finally found her. Otherwise, he’d still be a menace online!! 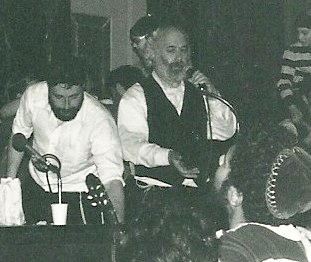 A Kosher Dating Odyssey tracks the progress of the author’s jolting changes in belief as he enters the world of dating pre- and post-Internet. Van Wallach is the product of a small-town Texas upbringing, a Princeton education and years of New York City and posh Connecticut living. The stories of his pursuit of romance–from Brooklyn to Brazil and beyond–provide a wry, revealing, and distinctly male perspective on Jewish online dating. Raised a Southern Baptist, Wallach found himself drawn to his parents’ Jewish heritage and the women who embodied it. To meet the special challenges of online dating, he took a marketer’s approach to packaging his unique background into a memorable screen name and profile. His book explores the highs and heartbreaks of dating the “smart, vulnerable and shtetl-lovely” Jewish women he met and adored after he left Texas. As he follows his muse far afield, he analyzes Jewish body image (his and hers), calculates ROEI (Return on Emotional Investment), identifies the sexiest Jewish movies (hint: his three favorites all have subtitles), engages in edgy encounters with “the competition” in the quest for a fair maidele’s hand, and contemplates the role of Jewish faith in times of difficulties. Part memoir, part how-to, and partly just off-the-wall, A Kosher Dating Odyssey will appeal to anyone who is interested in journeys of both the spirit and the flesh. Van Wallach is a writer in Connecticut. A native of Mission, Texas, he holds an economics degree from Princeton University. His work as a journalist has appeared in Advertising Age, the New York Post, The Journal of Commerce, Newsday, Video Store, The Hollywood Reporter, and the Forward. Van has been a regular contributor to the Princeton Alumni Weekly since 1993. He contributed a chapter on home-video economics to the second edition of The Movie Business Book. A language buff, Van has studied Spanish, Portuguese, Russian, Yiddish and Hebrew, although he can’t speak any of them. His travels have included Australia, New Zealand, the USSR, Northern Ireland, Mexico, Cuba, El Salvador, Brazil, Israel and the usual parts of Europe. Click here to visit Van’s blog. A Kosher Dating Odyssey is available in 5×8 paperback and Kindle editions on Amazon.com, Amazon.co.uk, Amazon.de, Amazon.fr, and Amazon Japan. Wholesale orders can be placed through info@coffeetownpress.com and Ingram. Libraries can also purchase books through Follett Library Resources or Midwest Library Services. Other relationships would follow (By year’s end I was dating Calypso, whose story you will find if you keep reading), but as time passed I thought fondly of Adina. We parted in frustration, not anger. Four years later, on a rainy evening on the Upper West Side, we ran into each other again. We immediately had a long catch-up coffee klatch in a diner. Adina had left journalism to study social work, while I was several years into a stint as a globe-trotting freelance writer. Freed from the anxieties of stillborn romance, we shared a warmth and were happy to see each other. That’s one missed farewell in a digital world that logs birth and death regularly. I would never have known about Adina’s passing without the Internet. Online, the once-hidden and unfindable becomes common, jolting knowledge. Through Facebook, I read daily about the illnesses of friends’ families, with prayer requests and mentions of deaths of parents, siblings and, most grievously, children. On Facebook, I learned that the son of one friend from Mission, for example, was killed in Afghanistan, bringing the war to me in a terribly personal way. We’re in our fifties and older; passings happen and the pace quickens with age.